This authentic safari offers more than just wildlife viewing. 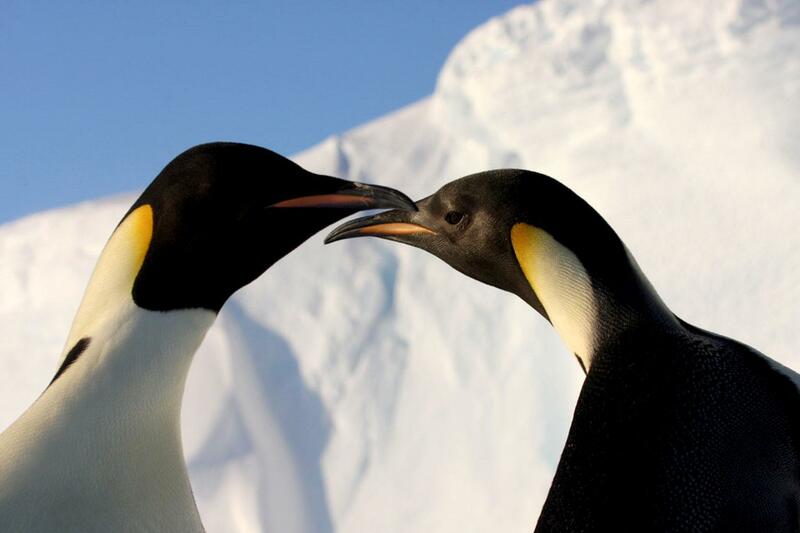 You will literally live with the Emperors and witness first-hand their amazing adaptation to the Antarctic environment. 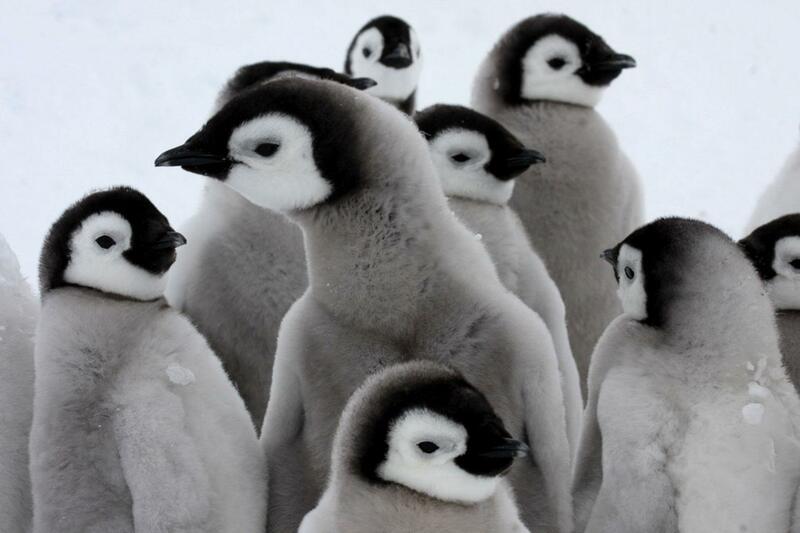 Fly to an Emperor penguin rookery on the remote Antarctic coast and spend several days immersed in the wildlife activity. 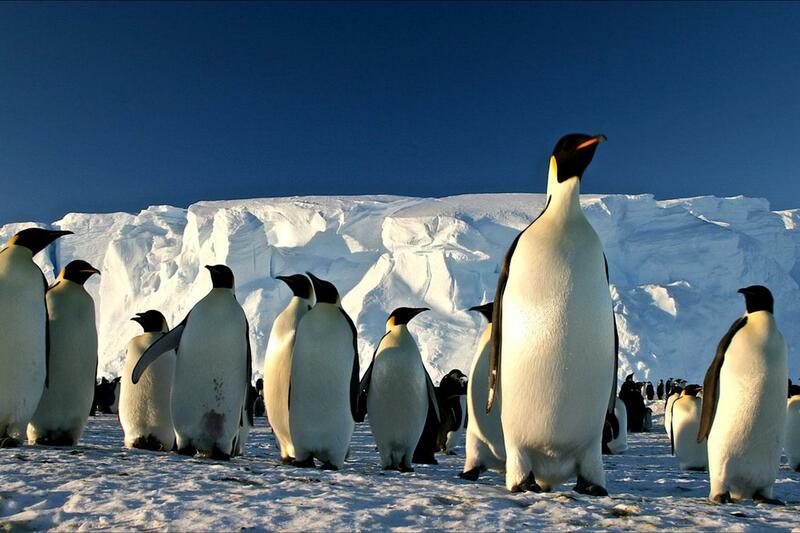 Photograph the majestic Emperors against a spectacular backdrop of ice bergs. Fall asleep to a chorus of trumpeting calls, and wake to find curious visitors outside your tent. 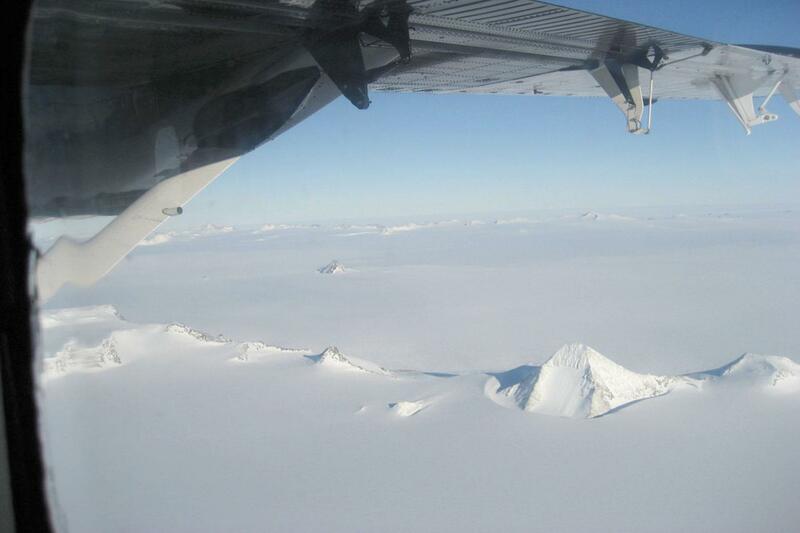 Then fly to the Geographic South Pole, the most remote destination on Earth. Contemplate the heroic explorers who crossed this frozen continent more than 100 years ago. Feel the significance of this place and of your journey. Walk around the world and savour the moment. 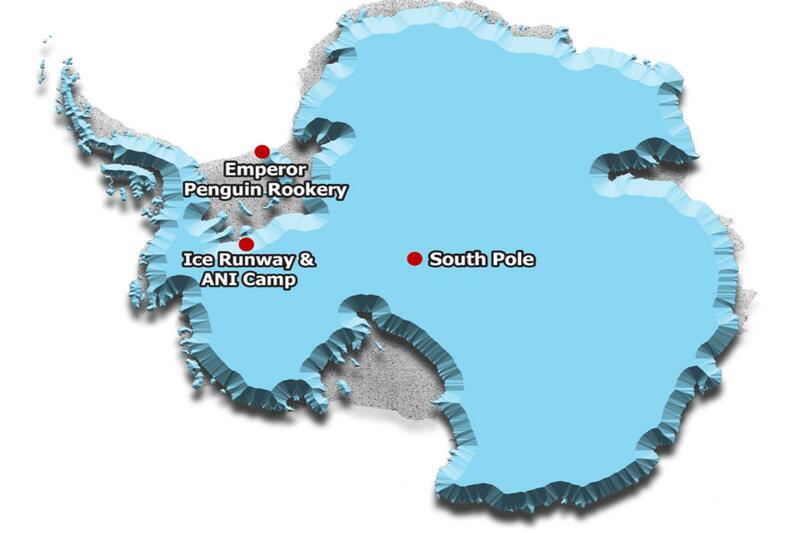 Day 1 – Fly to Antarctica Fly from Chile to Antarctica by private transport jet. Land on ice runway. Settle in at Union Glacier Camp. Day 2 Acclimatize to Antarctica Today is an easy day to acclimatize to Antarctic conditions. We will have an orientation to camp and life in Antarctica, review expedition logistics with our guide, and enjoy a presentation by our staff naturalist about coastal wildlife and wildlife viewing procedures. Days 3-5 Living with the Emperor penguins After a leisurely breakfast we pack up and fly by ski aircraft to the remote south coast of the Weddell Sea. 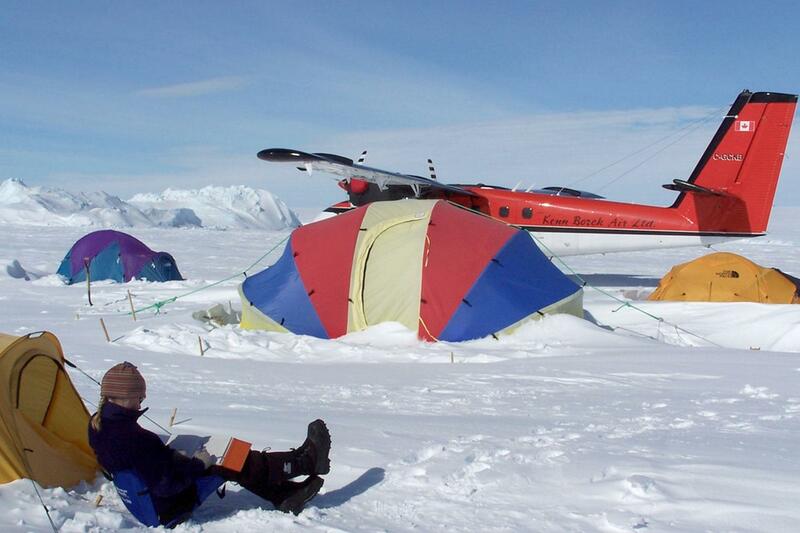 We land on multi-year sea ice near the Emperor rookery and our guides set up a cozy field camp beside the aircraft. The rest of the day is ours to explore and we have our first audience with the Emperors. Experience the rhythms of the rookery at your own pace over the next three days. Take guided walks with our ANI naturalist or do your own thing. Meal times are flexible so you can photograph and explore when the lighting and mood are just right. Meals are prepared by our guides and include hot meals and portable snacks. Watch adults display and feed their young. Listen to trumpeting and whistling calls as parents and chicks search for one another. If lucky, we'll photograph Weddell seals lazing by tide cracks. And at each step we'll marvel at the magnificence of where we are. Each night, fall asleep to the mingled calls of thousands of Emperors. At the end of our third day we pack-up the aircraft and fly back to Union Glacier Camp. Day 6 Union Glacier We take a day to enjoy the comforts of Union Glacier Camp and prepare for the next leg of our journey. 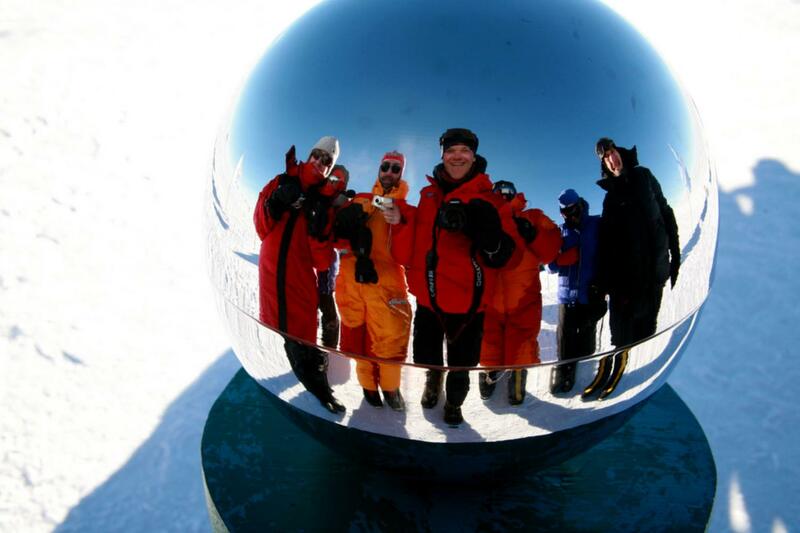 Day 7 In the footsteps of the Explorers Today we fly to the South Pole, the holy grail of polar explorers. A 4-5 hr flight brings us to our destination and as we step off the aircraft, we are immediately struck by the significance of this place and our journey. We have arrived at the heart of the 7th continent and at the axis of the earth. Here all 360 lines of longitude meet and the ice is nearly 10,000 ft (3,000m) thick. This last great geographical prize captured the imagination of a generation of explorers, who suffered extreme hardship and even gave their lives to claim it as their own. 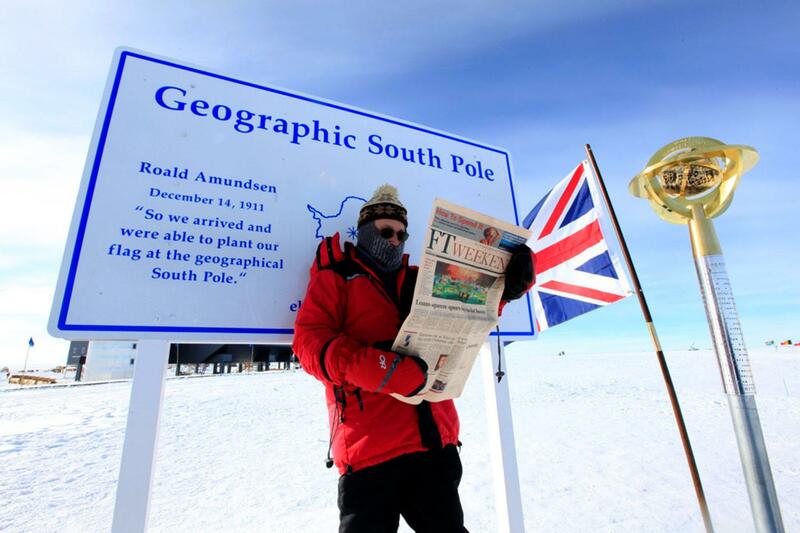 We will take plenty of time for photographs and reflection at the Geographic South Pole and at the colorful Ceremonial Pole which commemorates the signing of the Antarctic Treaty. Inside Amundsen-Scott station we will see what it is like to live at the South Pole and learn what makes the South Pole a unique scientific laboratory. After our visit we re-board the ski aircraft and return to Union Glacier Camp, where we will toast our achievement and enjoy a celebration meal prepared by our chefs. The South Pole has been designated an Antarctic Specially Managed Area (ASMA #5) to conserve the environmental, scientific and historical values of the area. We ask for your cooperation in respecting visitor guidelines during any time we may spend at the South Pole. Day 8 Union Glacier On our final day we have a chance to explore scenic Union Glacier. 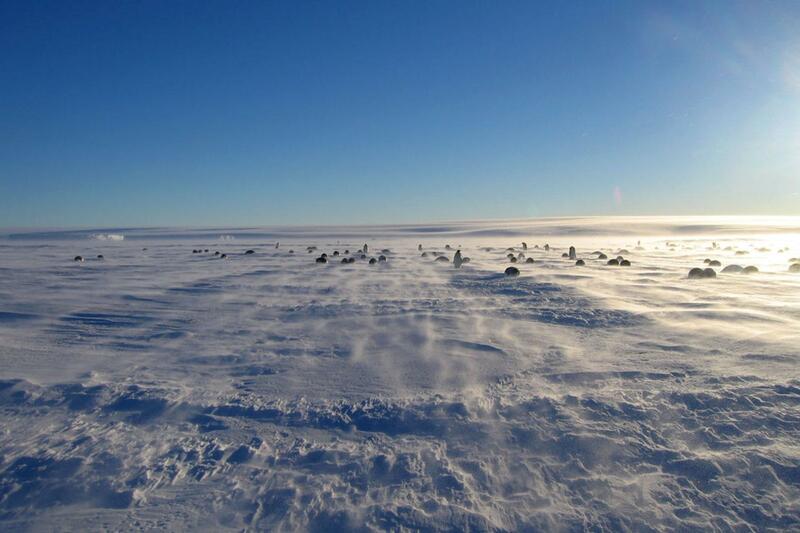 This day also provide a second opportunity for our South Pole flight, in case of poor weather on Day 7. Day 9* Return to Punta Arenas, Chile The aircraft from Punta Arenas will arrive with a new collection of avid explorers and you depart for the final leg of your Antarctic experience. The staff will meet you at Punta Arenas airport and transfer you to your hotel. * Schedule No two Antarctic experiences are exactly the same. 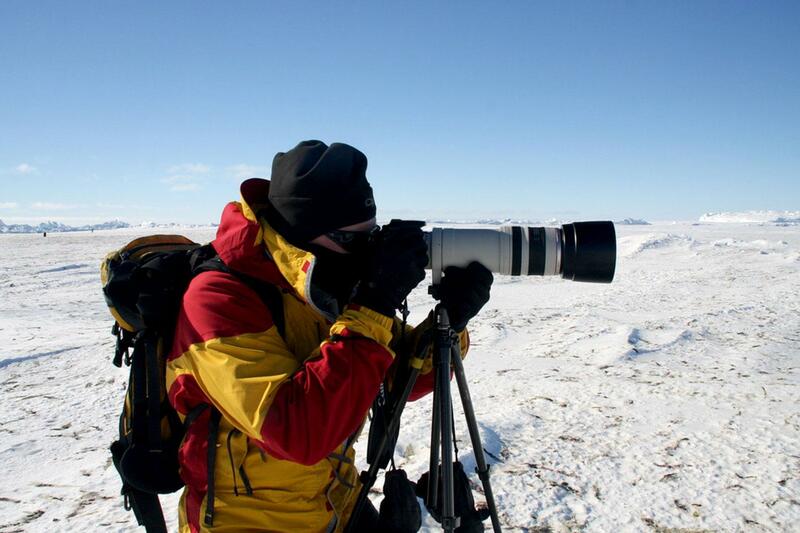 This is part of the excitement and adventure of Antarctic travel. The itinerary above highlights typical activities and experiences. Exact timeline and details will vary from trip to trip. Trip length may vary by departure Please anticipate delays and do not plan anything for at least a week after your scheduled return. Allow yourself to enjoy this unique experience without the stress of pending commitments.